My green-fingered cousin sent me some rhubarb in the mail. When I saw her last week in Edinburgh, she offered to pop some of her bumper crop in the post for me but I didn’t quite believe she would do it. 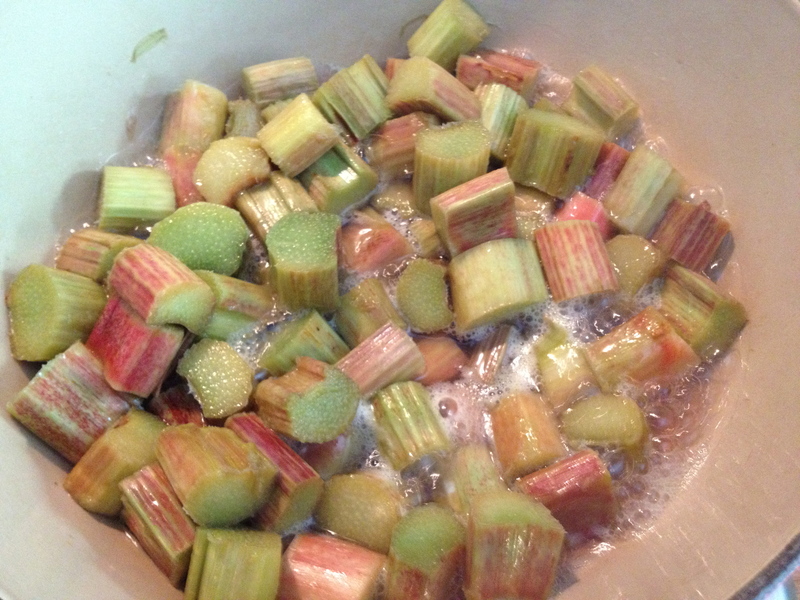 Next thing I knew, a large brown paper envelope was plopping through the door, filled with healthy stalks of rhubarb. I’m a big fan of this maligned fruit, in large measure because of the spectacular rhubarb pies my grandmother used to make. My nana was a great baker and her pastry was short, buttery, but not sweet. 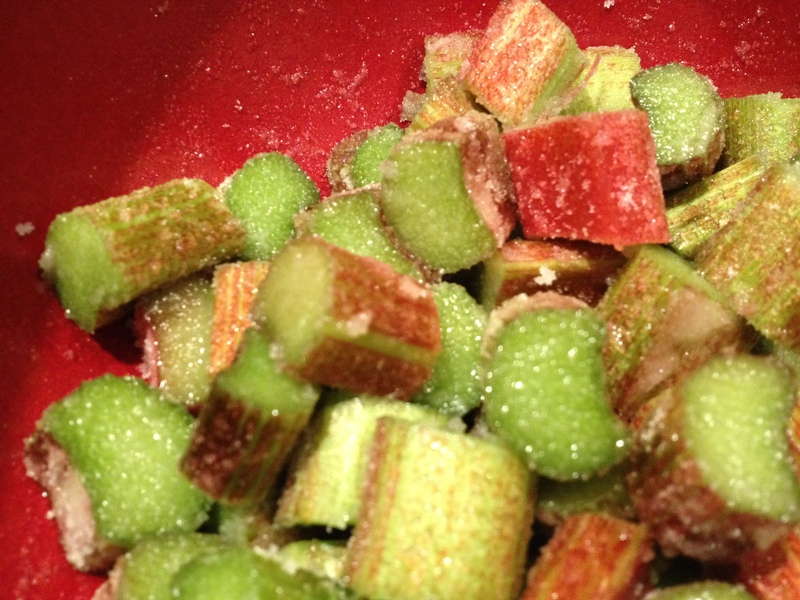 It was a great match for rhubarb, which she sweetened with mildly horrifying handfuls of sugar. The resulting pie set me up for a lifetime of rhubarb love but it’s not an everyday dish. 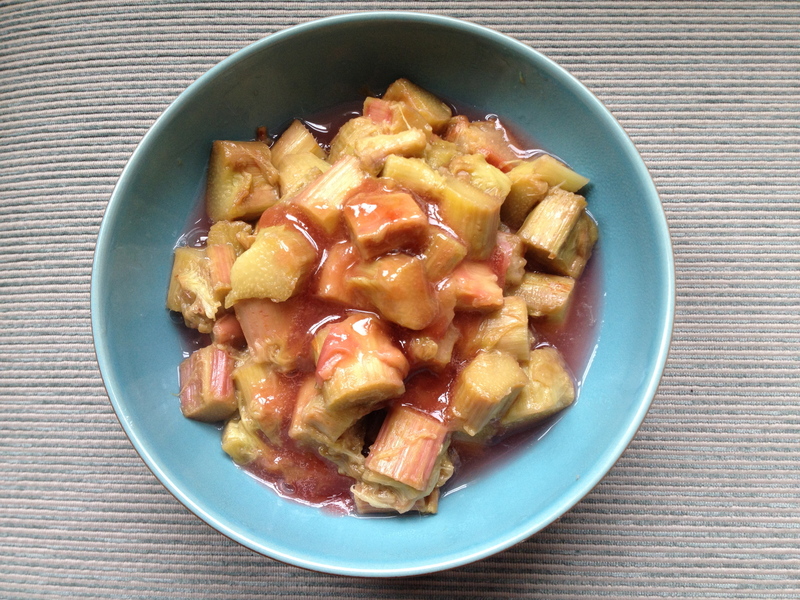 I’ve done a rhubarb compote before on the blog, but this is a neat technique that Lemur friend K shared, which he got (in some fashion lost in the midst of time) from iconic cookbook editor and writer Judith Jones. Here, the rhubarb pieces don’t break down but keep their shape and colour, while their liquid turns into a delicious ruby syrup. It’s very simple, but I had never done it this way before and it really is a cut above your regular compote. Start the day before you want to eat your compote. 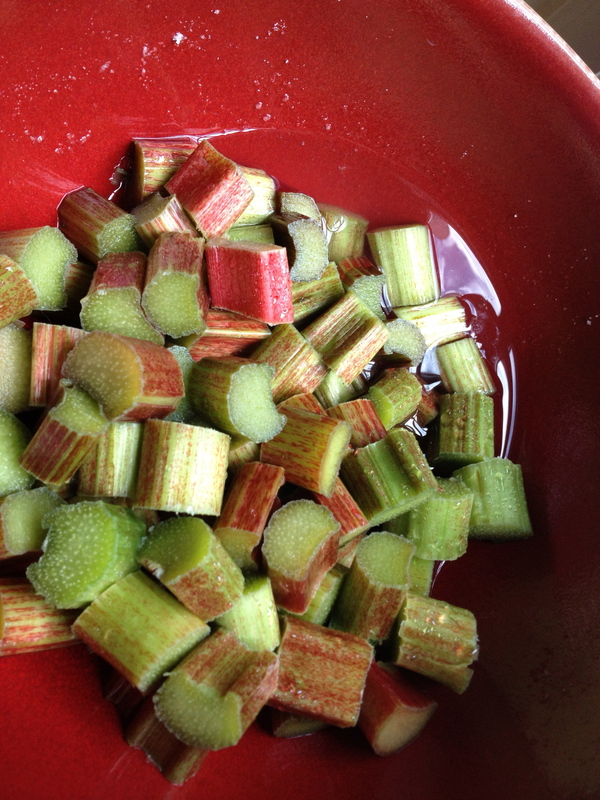 Slice the rhubarb into inch long chunks, put in a large bowl and sprinkle on as much sugar as you usually like (hint, more than seems initially reasonable, less than a Scottish grandmother would add). 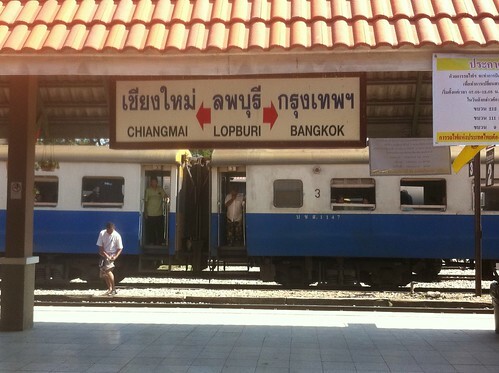 Leave to sit overnight. The next morning, you’ll find the rhubarb has released a bunch of liquid. Pour the whole lot into a pan and heat over a medium-high heat till boiling. 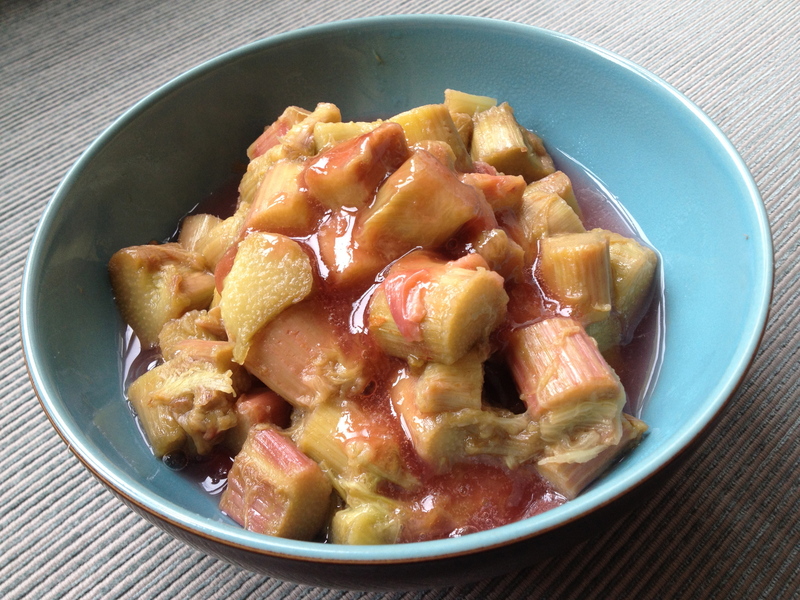 Turn the heat down to medium and cook the rhubarb for about five minutes. If you are relatively gentle you’ll find the rhubarb keeps its shape and doesn’t break down as in a normal compote. It will also cook very quickly. 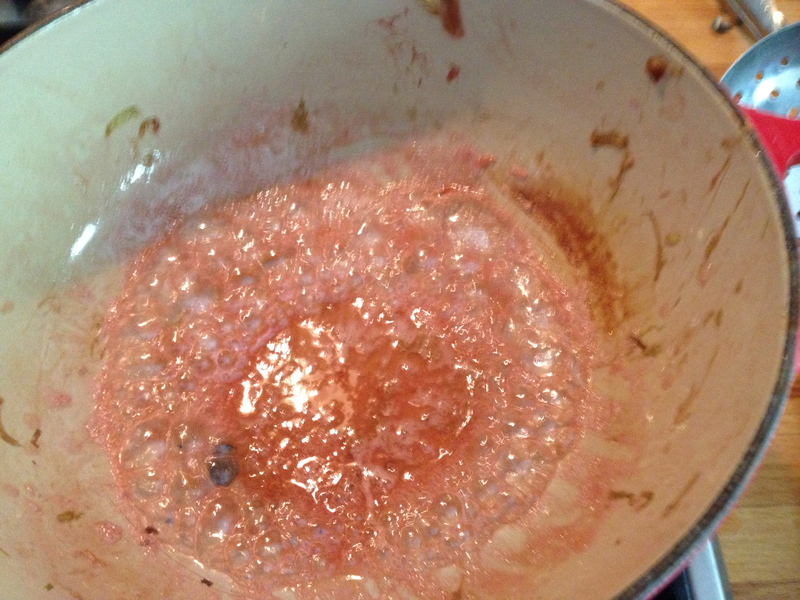 Remove the rhubarb carefully with a spider and reduce the remaining liquid to a thick pink-red syrup. Pour the syrup over the rhubarb and enjoy with yoghurt and granola for breakfast, or with cake or on ice cream. 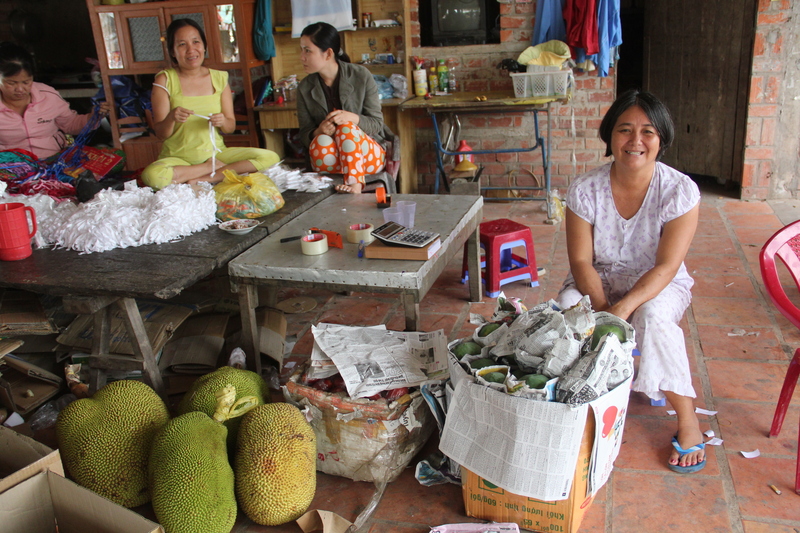 Remember when I wrote about how nice and welcoming Vietnamese people are? Well, this is another one of those instances. 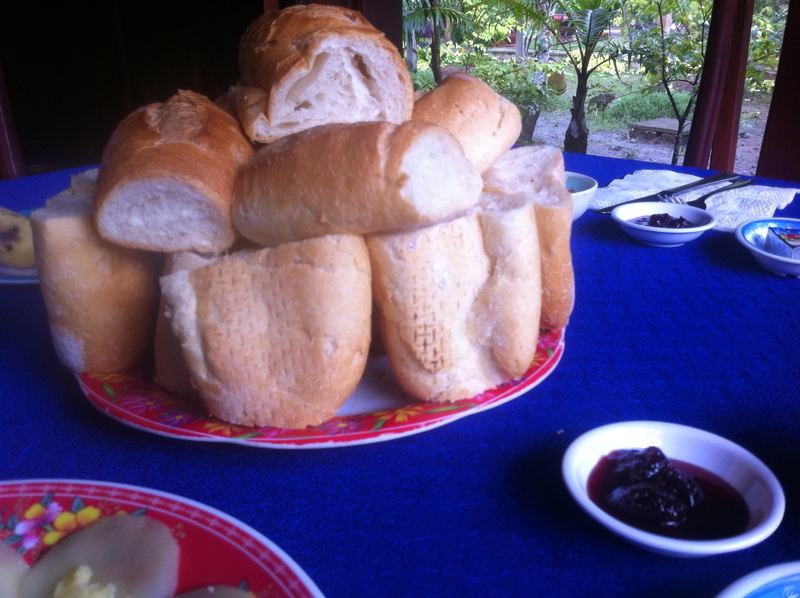 When we were on our Mekong homestay, the breakfast provided was a perfectly lovely spread of omelettes and French baguettes with jam. But as we sat on the verandah waiting for our Vietnamese coffees to drip through, our guide Anh arrived on her bike from the village with a whole other set of breakfast goodies. 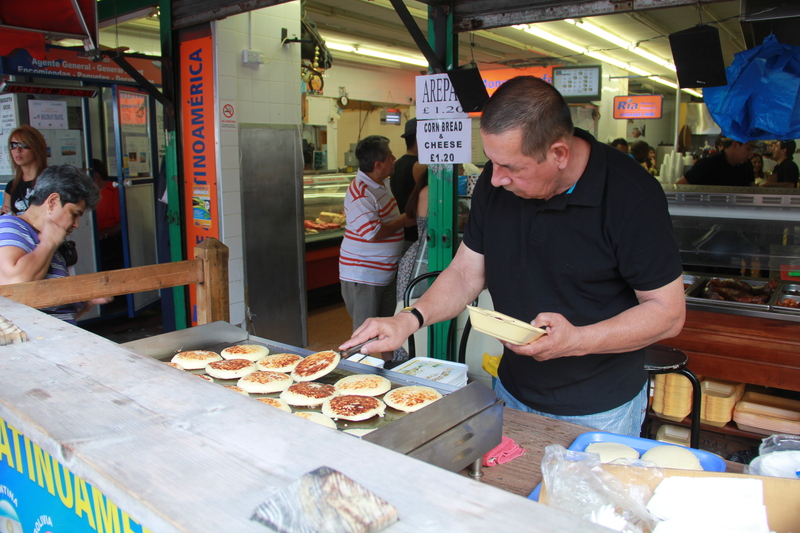 She’d heard me say that I didn’t eat eggs and knew that I loved eating little snacks at morning markets, so she’d picked up an array of local treats at the market for me. How sweet is that? 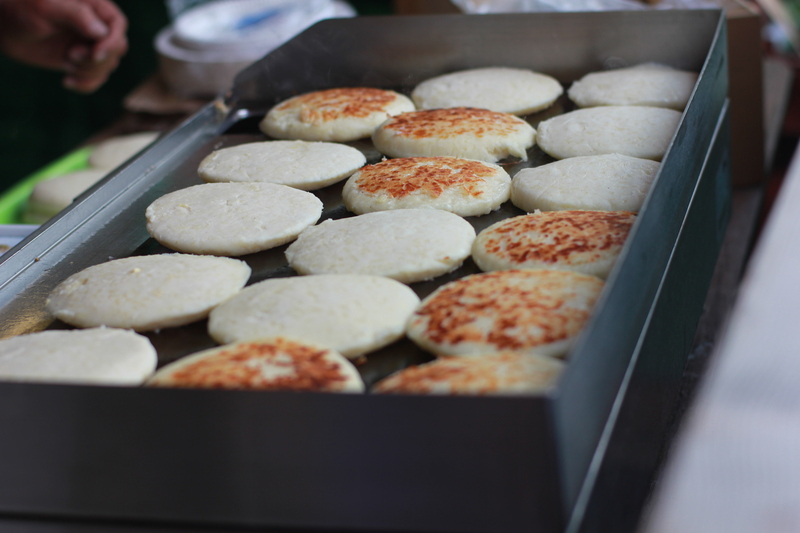 The ones pictured above are bánh chuôí (the little rhizomes made with rice flour and banana, which were really delicious and kind of reminiscent of the steamed banana cake we had in Saigon) and bánh bò (the flat white discs, which look very plain but were actually really good, flavoured subtly with coconut milk). 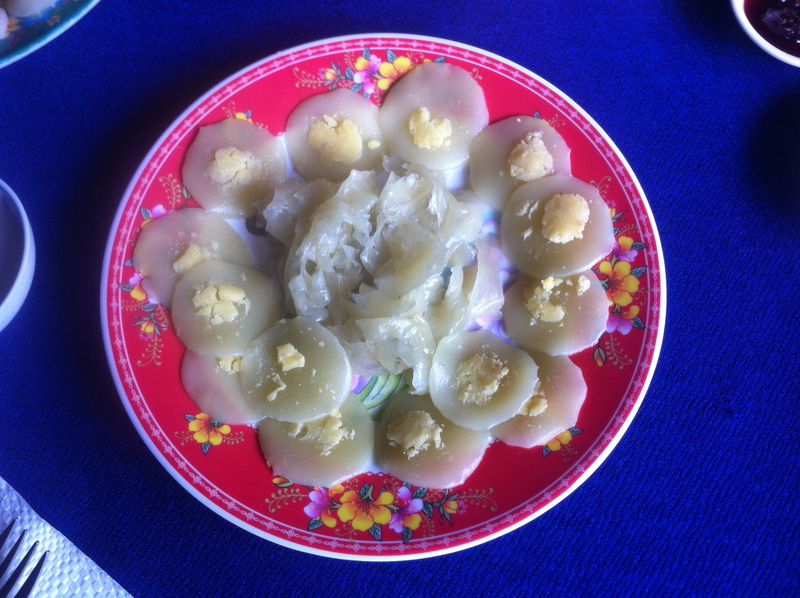 Around the outside of this plate are bánh bèo, made with rice and beans, and in the middle are bánh lá, which are also made with coconut milk and look a bit like papardelle. These are probably the least photogenic of the lot but they tasted amazing dipped in coconut milk. And of course there was still a vast pile of French bread to get through with lovely runny fruit preserves. 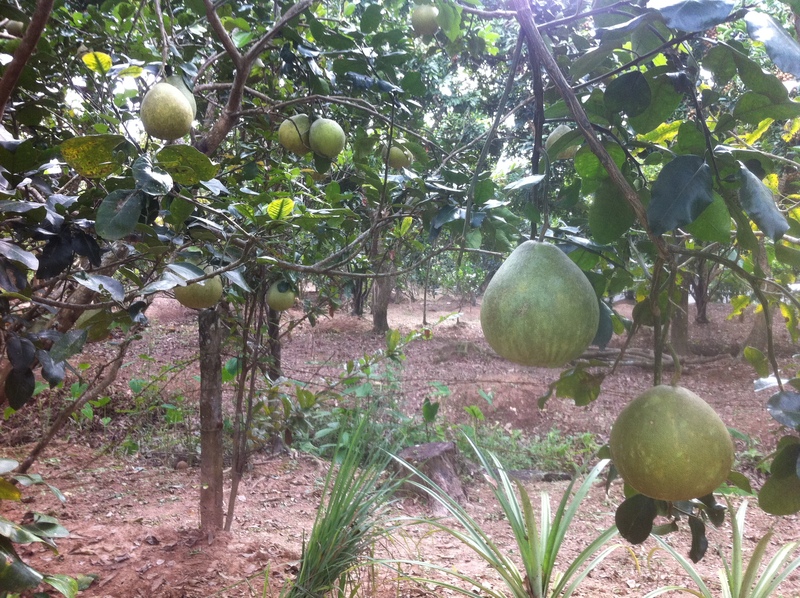 It was incredibly relaxing to sit on the verandah, looking out at the jackfruit trees and eating our way through all these beautiful looking breakfast snacks. 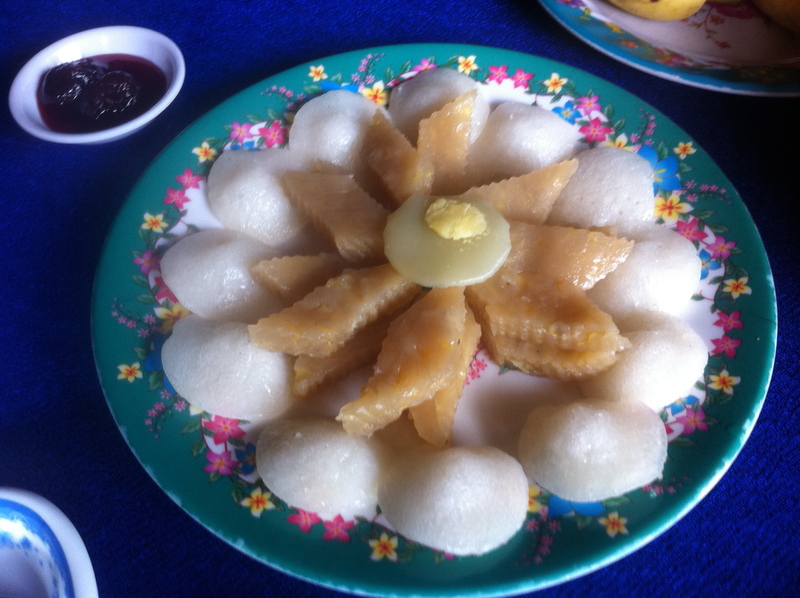 I mean, really, not only did Anh go out and buy these for me, our homestay hosts presented them so beautifully. They could have been annoyed that the picky guest didn’t want to eat their eggs but instead they created this elegant Vietnamese spread. Tourist with a personal touch is one thing but the Vietnamese welcome was a whole other level. (Let me give you another example. I had mentioned to Anh at one point that this trip was for a ‘special’ birthday. When we were in our hotel in Chau Doc, she arrived at our door with a package: a birthday cake with my name and age iced onto it, candles, lighter, vase and a single rose. When we were checking into the hotel, she’d had a sly look at my passport to find out how old I was and my exact birthday, and had gone out and had a cake iced for me! I was so touched. There I was, thousands of miles from home, and someone had brought me a personalised birthday cake.) So, this was a simple breakfast but a really lovely gesture. Fortified, we went out to explore the Mekong around Co Co, where the fruit trees are abundant and the fruit sellers also super friendly. I don’t know London all that well yet. I can’t tell you how to get anywhere on the tube without a map and large swathes of the place are a complete mystery to me. Since I am mostly there for work or for films and theatre, I spend most of my time in the parts of central London that are not known for their chowhounding potential. Nonetheless, there are some things I consider to be a matter of basic pride. I can direct you to a very good Thai restaurant. 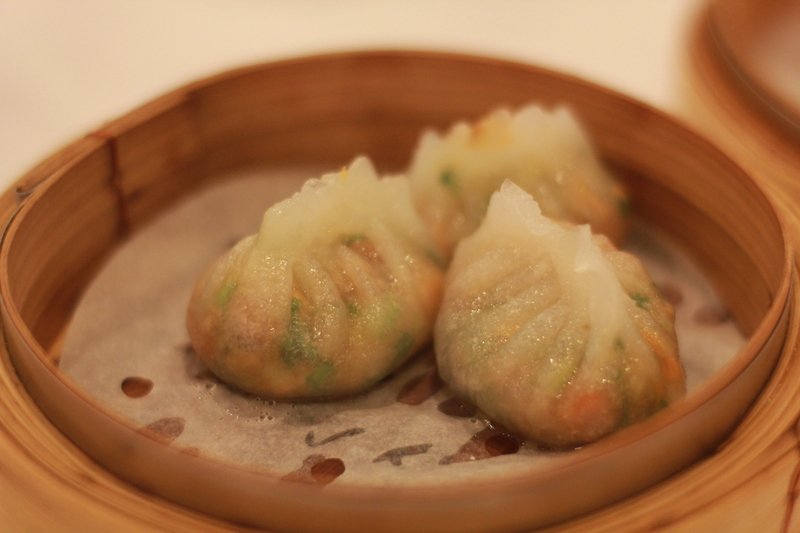 I can take you for house-made pork dumplings. And I know where they make good nasi lemak. Nasi lemak is real comfort food. 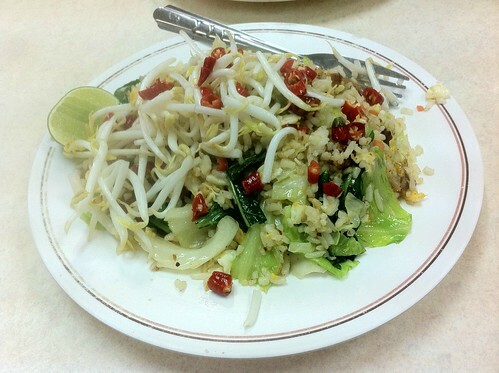 Often considered to be a national dish of Malaysia, this combination of coconut rice, crispy anchovies, peanuts, cucumber, sambal and often chicken, egg or other proteins hits all the right spots of flavour and texture. 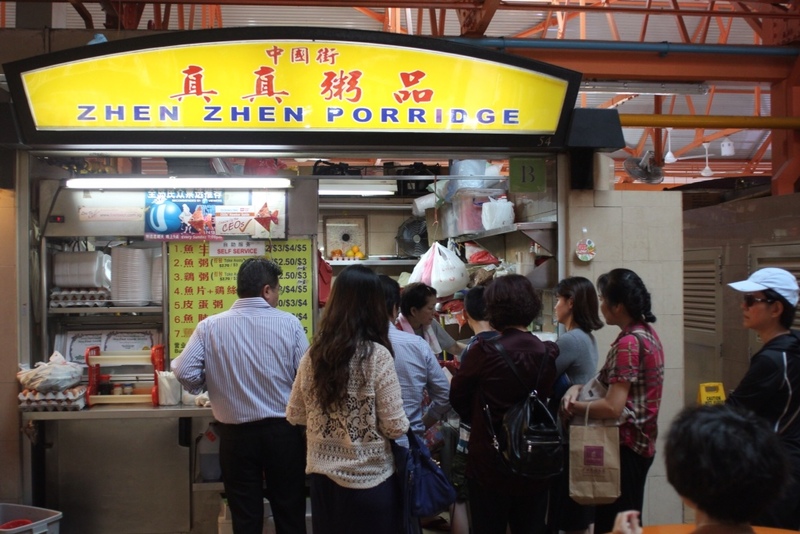 Originally eaten for breakfast, it has become so popular that it’s now served all day. 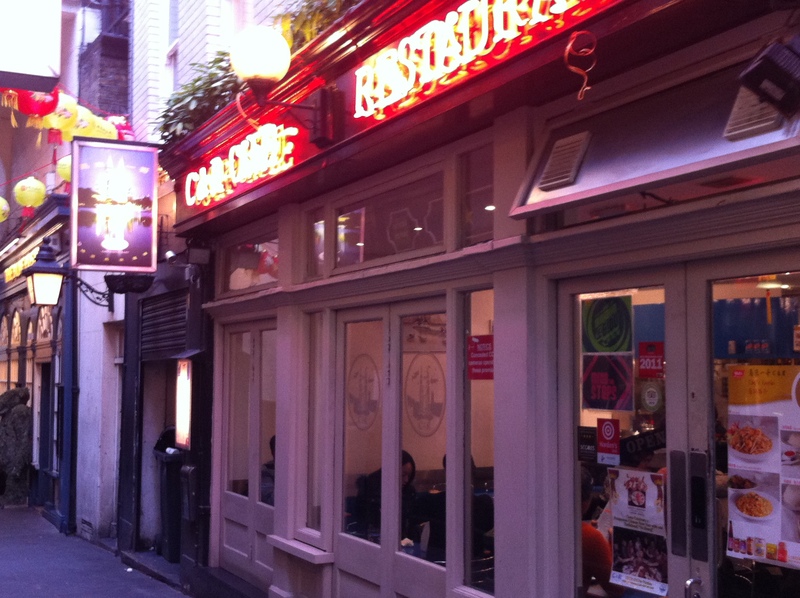 I haven’t yet made a thorough study of London’s more far-flung Malaysian restaurants (though obviously, this is an urgent goal) but if you’re near Soho, you can’t do better than C&R Cafe, located down the kind of alley I think of as highly promising and some of my friends view as mildly alarming. 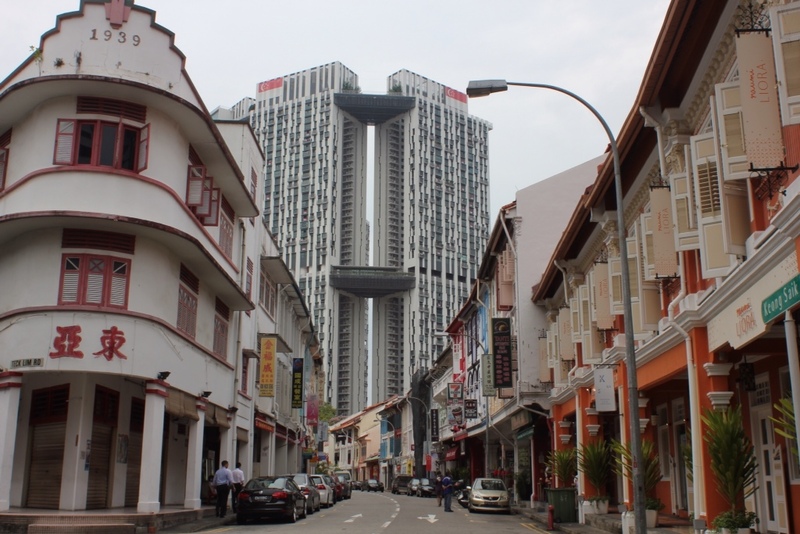 C&R is exactly the kind of Malaysian place I like – lacking in decor and general warmth, but more than making up for the formica atmosphere with reassuringly flavourful food. Their char kway teow is shrimpy and chewy, their Singapore laksa is rich and coconuty, and their Assam laksa is hot and sour. 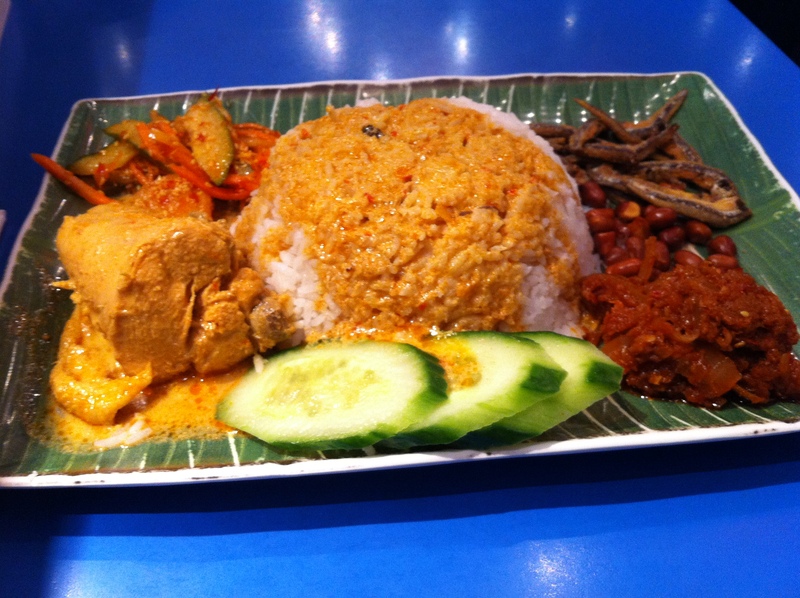 And their nasi lemak is the very definition of soul food for the hungry and out of sorts. 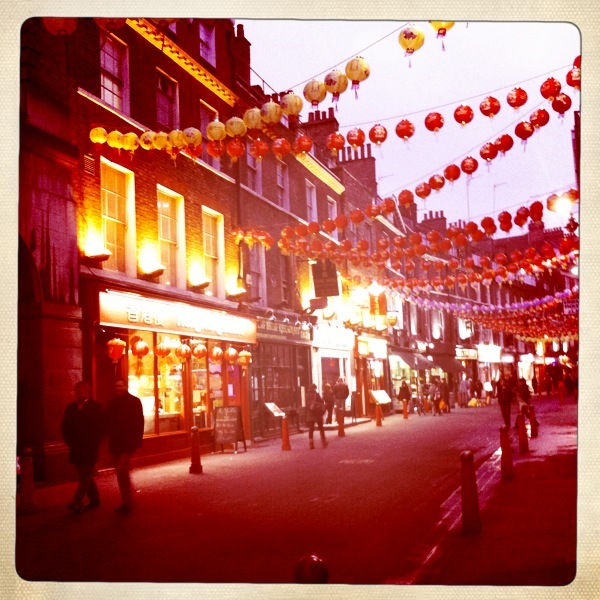 Yesterday, I had an early start at work and found myself in London at 4pm not having eaten all day. Obviously, I am not the kind of person that just forgets to eat, so I wasn’t feeling especially great about my situation. Luckily, while I had a plan to meet Thifty Gal in the evening to see Danny Boyle’s Frankenstein at the National Theatre, she couldn’t meet me beforehand and I had a couple of hours free. Much as I love the very generous Thrifty Gal, my idea of a promising alley is her idea of hell, so eating solo was just what the doctor ordered. I made a beeline for C&R and, since it was technically breakfast, couldn’t resist a plate of nasi lemak. 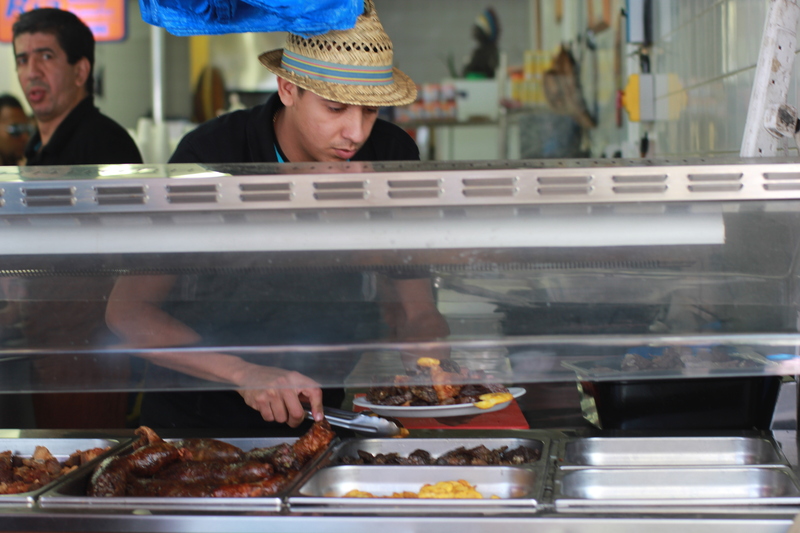 Their version comes with a substantial portion of curry chicken, as well as achar, or pickled vegetables. Their home-made sambal is only moderately spicy but nicely oniony, and those crunchy anchovies are little nuggets of salty heaven. As it turned out, we both hated the play (seriously, there’s a good reason the book’s not told from the monster’s perspective) and wished we’d gone to a bar instead, but I can’t complain. I got to see a good friend, watch the charismatic Benedict Cumberbatch on stage, and set my over-stressed self to rights with a restorative nasi lemak. My friend K introduced me to the pleasures of rice porridge – not quite Chinese congee but a texture more like Italian polenta or Indian upma. I’m always on the lookout for non-traditional savoury breakfasts because I don’t like eggs so most of the savoury breakfast world is closed to me. I love Asian breakfasts, of course, because I don’t like the blandness of most western morning foods and I don’t have any qualms about breaking out the chilies first thing in the morning. That said, this dish is endlessly variable, and if you don’t want spicy food first thing, you can easily modify the dressing to be more sedate. I’ve used my leftover red curry paste but you could use nam prik pow, chili paste or just skip the chilies altogether. The first trick is to find your rice polenta. If you live in the US, the best kind is Red Mill rice farina, which has a lovely nuttiness because it’s made with brown rice. In the UK, I’ve found brown rice polenta impossible to come by, but Indian stores sell the white rice variety, often labelled ground rice. You don’t want it to look like flour but more like polenta or cornmeal. First make your dressing. Mix light and sweet soy, sesame oil, and rice vinegar and emulsify with a fork. You can add some sriracha to this for added heat. Slice the shiitakes or, if using portabella mushroom, cut into small cubes. Heat a little oil in a non-stick frying pan and, if using chili paste, fry it for a minute. Add the mushrooms and fry till browned all over. Meanwhile, slice the spring onions and pick cilantro leaves. 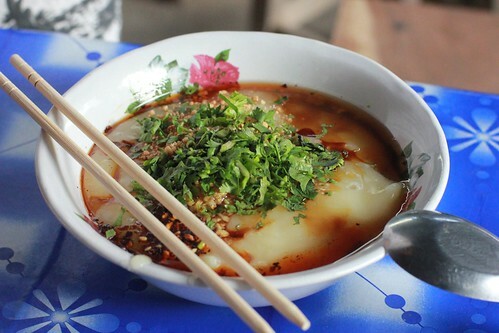 To cook the rice porridge, boil 3 cups of water and then add 1 cup of porridge. Lower the heat and stir. White rice porridge will cook in just a minute while brown rice will take about 5 minutes. Either way, stir constantly and taste for doneness. You want it to be soft but to retain a little grainy texture. It shouldn’t be totally mushy. 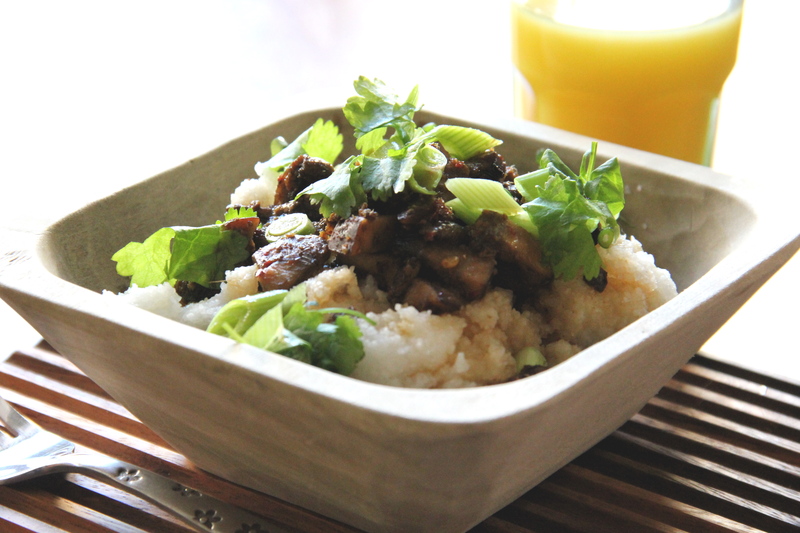 To serve, top porridge with mushrooms, spring onions, and cilantro and spoon over a few teaspoons of dressing.